Red Letters Enterprises had always been a dream of Mike Richards, who has been completing projects for himself, friends, and family for decades. When he retired in 2007, he launched that dream with his wife Diana. Red Letters has been successfully completing quality projects and gaining loyal customers since. 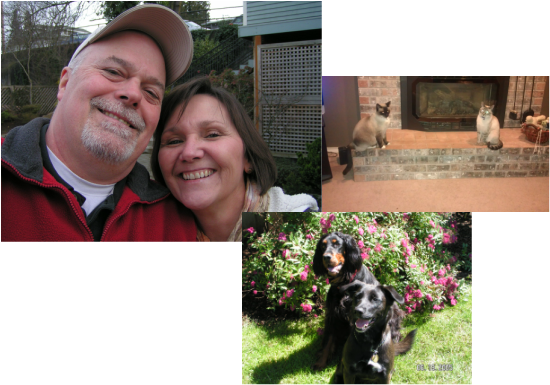 Mike and Diana have been married for 30+ years and enjoy their two dogs Angel and Sugar and two cats Lucy and Patsy. The name Red Letters comes from their faith, referring to Jesus' words highlighted in some bibles in red print. Mike and Diana try to live out their faith in their work to serve and glorify God and to be a testimony to others. We have a family of three adult children: Sandra, Tim, and Monica. Sandra is a school teacher in Seattle who specializes in elementary and early-childhood education. She is married to Frank and has a cute pug named Schmoo-Schmoo. Tim is a lawyer in Seattle who is practicing public interest law. He is married to Carrie and has a delightful pug-chihuahua mix named Bu-Bu. Monica, our youngest, is in the health care field in Portland, where she lives with Mike and her dog Bandit.